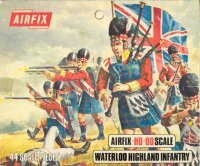 With such a wealth of Napoleonic sets around these days, it seems strange that the very first, this set of Highlanders from Airfix, was only number 35 in their range. Nonetheless it was a popular choice, and what toy soldier enthusiast of those days did not boast a set of these figures in their toy chest? As a result the above images will trigger many happy memories for older collectors, but how do they fare by today's standards? The sculptor for this set clearly had in mind the British infantry in their squares as most of the poses seem suited to that scenario. There is just one advancing pose, and no marching or standing in ranks poses at all. However there is a falling wounded figure, which is a strangely common choice for Napoleonic Highland sets (both Esci and Italeri made them, and several 1/32 scale sets such as that by Timpo also have one). Inevitably a piper is included, as is a drummer, which is fine, though why the piper is considerably taller than everyone else is a mystery (and he also holds his pipes in a strange way). The flag-bearer is welcome, but has been given a ridiculously small base, and many hours will have been spent attempting to make him stand on his own - all but impossible on the best of surfaces, never mind carpet! It is fortunate that the flag is a lot smaller than it should be, since the toppling issue would be unsolvable if it were the correct size. What is most obviously missing is an NCO, with just a mounted officer present here. The level of detail is not up to today's standards, though as is often pointed out these were just toys at the time. The kilts are not engraved with a pattern, which is a good thing to our mind, though some may wish for a check to guide their painting efforts. Still the proportions are reasonable, and a better job was made of showing the feathers on the bonnet than some more recent rivals. The length of the bayonet seems to vary widely, though this may be a problem with plastic run in particular batches, and some of the details of the poses are not realistic (such as the man resting his cocked musket on his elbow). There is also some flash, though not nearly as bad as the worst examples. There are no real show-stopper accuracy problems, but lots of little deviations and a few basic mistakes which help show the age of these figures. The mounted officer has a sword but no scabbard, and also wears a crossbelt over his right shoulder which is clearly visible on his front but is entirely missing on his back! All the men are missing basic kit like haversacks and canteens, and bayonet scabbards do not always meet the belt that is meant to support them. Apart from the drummer, none of the men seem to have the cross-strap across their chest for their pack, which is itself a poor model of the proper Trotter design. Kilts were supposed to have the bottom edge one inch off the floor when kneeling, so some here seem to be a bit short. None of the men wear the separate peak on their bonnet, which is perfectly reasonable (the 92nd regiment were banned from wearing them during the Waterloo campaign). The officer has the usual infuriating horse with separate base, though at least here the animal can be persuaded to stand by itself as all hooves are on the ground. In general this was a good set when it first appeared, but there is plenty of room for improvement now. Something of an institution in the hobby today, it is still useful provided you want to show static, defensive troops, but little use for anything else.